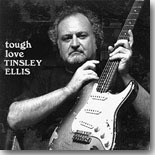 Veteran blues guitar wizard Tinsley Ellis goes back to his own Landslide label for release what might be one of his best yet. Tough Love is this month's Pick Hit. Soulful blues singer D.A. Foster enlists some very fine backing musicians, including the Phantom Blues Band, for his excellent CD The Real Thing, making it an easy choice as this month's Surprise pick. New Orleans guitarist Jeff Chaz makes up for the fact that many of his past albums are now out of print by releasing the excellent compilation Chronicles. It's this month's Flashback feature. Our What's New section features reviews of new CDs from Igor Prado, Jorma Kaukonen, Smokin' Joe Kubek & Bnois King, Shaun Murphy, Eric Sardinas, Tas Cru, Blue Lunch, Brad Hatfield, Peaches and Crime, and more.